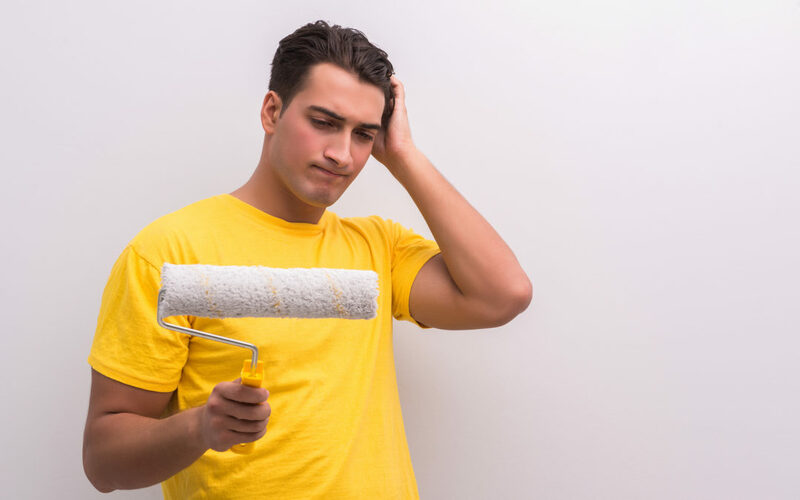 Of all the potential remodeling projects Raleigh/Durham area homeowners consider, painting is likely the most-attempted “DIY.” Most people think it’s as easy as buying a can of paint and a paintbrush. While you can paint a room that way, it skips over all the essential prep steps that ensure a clean, fresh result at the end. A new coat of paint is an affordable way to make a difference, but it can end up costing you even more if you don’t put in the time and effort up front to make it worth your precious time and money. Do certain more “handy” folks have some success? Sure. But many others run into the following predictable hazards of a DIY paint job. Read on to be sure you avoid these common errors with DIY house painting. Painting a wall begins when you dip the paint brush in paint, right? Wrong. Arguably the most crucial part of a painting job is making sure all irregularities are spackled and sanded smooth. Any holes, cracks, chips or lumps will be transferred to the newly painted wall unless they’re fixed beforehand. Nothing screams DIY job more than finding bumps and nails that have hastily been painted over. Amateur painters may not know where to start on the wall (is it the top or the bottom?). They also may oversaturate the brush or roller cover with paint, leading to streaks dripping down the wall. These runs then dry and betray a DIY job gone wrong. Does the paint you bought “cover” after one coat, or does it need two? Did you carefully inspect every area to make sure there is no trace of the old colors showing through? Mistakes in this area are common and make for an unattractive finished product. If you’ve ever seen a professional paint job, you can really tell the difference in this area. The lines where the fresh paint meets the ceiling, an unpainted section of wall or the trim are clean and straight. Novice painters don’t tape properly, don’t have a steady hand and don’t use the right tools and brushes. This leads to jagged lines with old paint showing or new paint overlapping onto other surfaces accidentally. Speaking of paint where it is not supposed to be, one of the biggest hazards of a DIY paint job is spilled paint. It may just be a drip or two on a piano or beloved piece of furniture, but quite often it is an entire can of paint tipping over and making a BIG, expensive mess. Gloss, semi-gloss, flat, eggshell, interior paint, exterior paint: we’ve seen it all and we’ve seen it all in the wrong places. There are certain sheens that should be used particular ways, in particular rooms. Not knowing the difference can easily sink a project. People also use the wrong paint by trying to do a “color match” and not getting it quite right. Two slightly different shades are usually very noticeable when seen side-by-side every day. Raleigh, Durham, Cary, Morrisville and the surrounding Triangle area relies on Robert Gordon Services for professional painting service. Eliminate drips, spills, underpainting, using the wrong paint and any other DIY disaster by trusting the experts to get the job done right. Give us a call today at 919-250-8038 to get started.